This wall has been in the making for over a year now. I had the idea to cover a wall with AstroTurf quite a while back, but just couldn’t find the perfect wall to do it to. 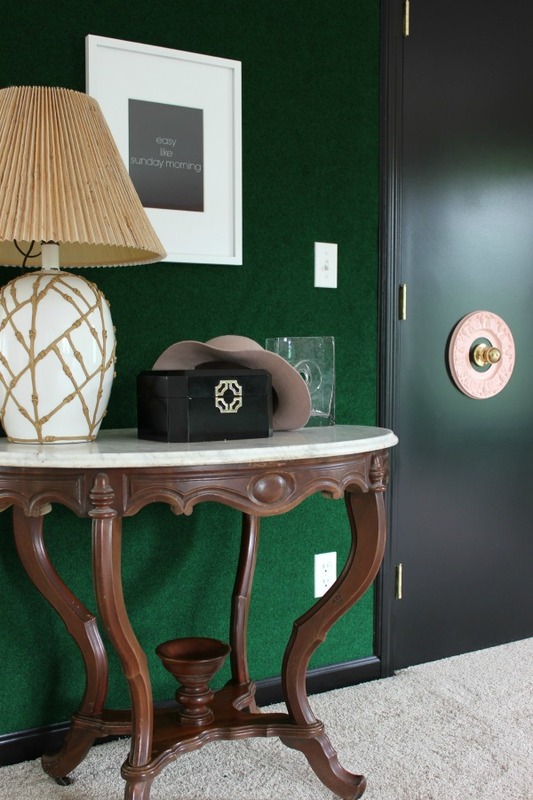 When I started dreaming up the design plan for the master bedroom makeover at the 70’s Landing Pad, I realized that an astroturf wall might just work perfectly in the space. I then looked around and realized that our closet wall would also be the perfect candidate for a little carpet treatment. The carpet isn’t actually true AstroTurf. 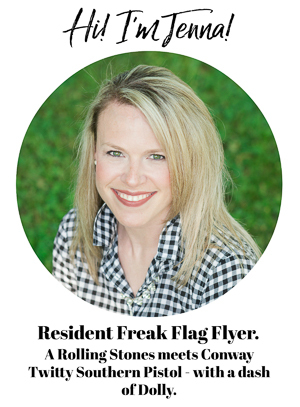 The real astroturf was just too shiny for the space, but this green outdoor rug was the perfect shade. It helps to create that vintage Palm Beach vibe along with the pink and black. I used two rugs for the wall and also bought moldings for the ceiling and around the door. 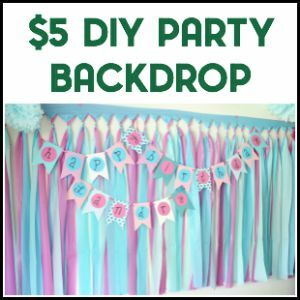 The total for the whole project is roughly $50. And it was so easy. Choose one edge of your wall to start on. 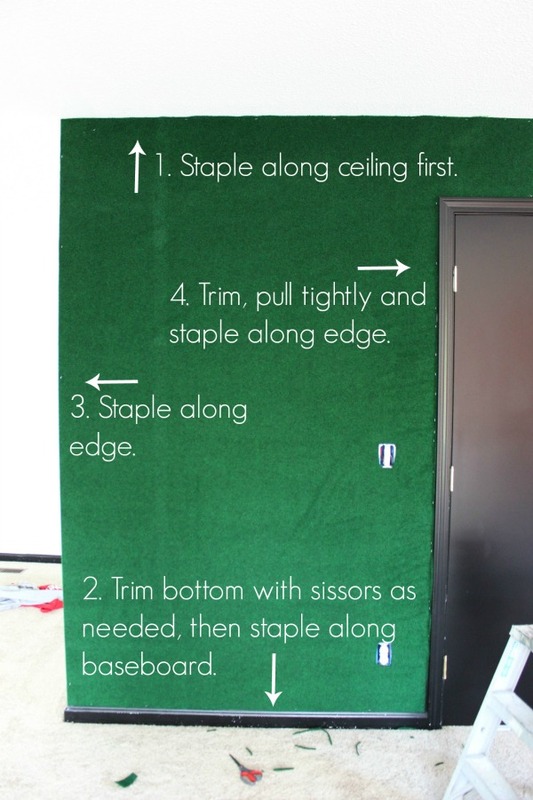 Unroll the carpet and first staple it to the wall at the top where it meets the ceiling. Align the edges of the carpet with the top of the wall and one of the side edges of the wall. You want all of the staples to be flush in the wall. If you have any that stick out, hammer them in. This was one reason why I used my battery powered stapler because it gets them all the way in the wall without hammering. Pull tightly on the carpet at the bottom and staple it down right along the top of baseboard in a couple of places. Trim the carpet as needed and continue to staple it down along the edge. Don’t go staple crazy. I found that one staple about every 9 or 10 inches was sufficient. Staple the carpet down along one side edge of the wall. Once more – don’t go staple crazy. Pull the carpet tightly against the one remaining edge that needs to be stapled down. Staple it in a few places then trim with scissors, pull tightly and staple. When one rug is up, continue covering the wall with another one if needed. 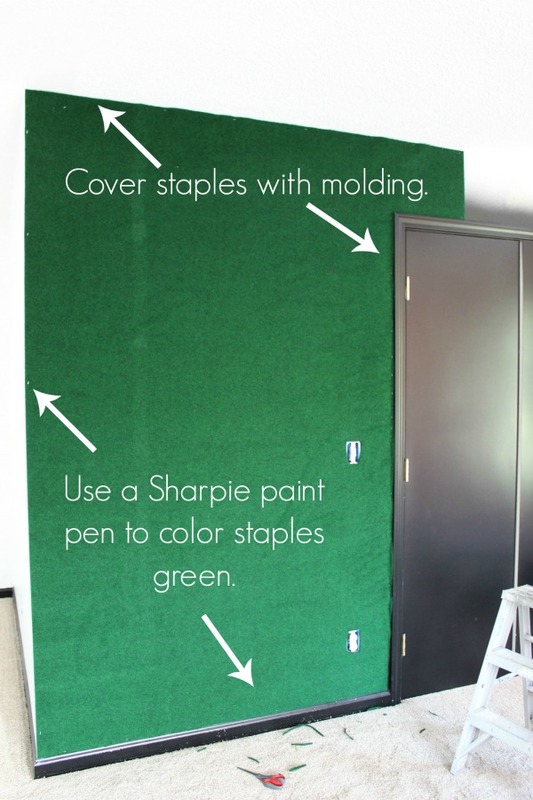 Use a green Sharpie paint pen to cover the staples along the edges of the carpet. You can also use trim as I did to cover them and give the wall a polished look. I had one small place above the closet that I had to cover with a scrap of rug. I just stapled it up and covered the staples with the paint pen. I love the extra texture and element this wall brings to the space. Ok, what do you think? Am I crazy for covering a wall with carpet? You can see the rest of the master bedroom makeover here. I was just getting ready to type, “WHY? Who would do this?” First, I hate that color. That wall looks depressed. Oh no. It looks depressed? You’ve got me worried now, Faye. What do you think I should do? Would reading to it make it feel better? Are there any self-help books for walls you can recommend? I’m assuming you are an expert in this area since you diagnosed my wall so quickly. Perhaps I should crush some Prozac, add water to make a paste and smear it on the wall? Do you think the wall may become suicidal because of it’s depression? I don’t know how much sleep I’ll get tonight now. I’m really worried. Also, I did something similar with fabric but I spray painted my staples first. I have tried the sharpie method but it just takes too long! I suppose that you could sharpie-color them first as well. Oh, spray painting the staples is a great idea! Hadn’t thought of that. Thanks! I have one suggestion: ditch the white outlet/switch plate covers. It draws the eye unnecessarily away from how great the wall it. 1. Painting the outlet/switch plate cover is the easiest solution. In fact, I painted the outlet too (but it was a quick brushing with some paint, being careful to not get any paint in the outlet.) Usually, I can just ignore the toggle switch on the light switch cover. 2. Buy some. (It’s always more fun when you get to go shopping!) Mirrored ones are good. Kristin at Hunted Interior has some fun glass ones that she did in her kitchen. My personal favorite though is a really good vintage one. Especially brass. Go the complete opposite of hiding, make them stand out even more. You must be reading my mind, MissC! I’ve been thinking the same thing about the switch and outlet covers. I’m thinking brass is the way to go! Different textural look Jenna – love it! You make it look so easy. Which, by the way, where do you get your ideas/inspiration from? 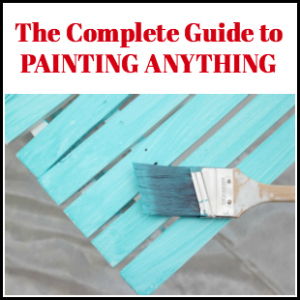 Reading other decorating magazines? other bloggers? Pinterest? Other? Thanks, Julie! A little bit of everywhere, Julie – I guess mostly magazines though. They are one of my addictions! Weirdly enough – television shows and movies too – I have paused a movie or show too many times to count to take a picture of the screen because I saw something in the decor of the room that I liked! haha! I do this exact same thing! I wasn’t even going to comment until I saw this note. As an aside, carpeting your wall IS an insane idea but it’s also an idea I pitch to my husband once every few months. ???? Glad I found your blog. Just added you on Instagram today. Thanks, Punita!! I love how this wall turned out – it was a crazy idea, but luckily it worked! How do you clean this? When dusty do you run the vacuum cleaner over? Carpeted walls were once a part of the computer room where I recently retired from but were removed during my time there. They were found to be difficult to maintain & clean and held a large number of dust & allergens. Everyone was sneezing when they were in this room. But in one respect carpet kept the noise levels down. I think I should be able to use the vacuum hose on it! haha!! I totally understand, Susan! It definitely isn’t something for everyone! Well, I am old enough to remember shag carpet on the walls in the 60’s/70’s. Didn’t care for it then and still not a fan. 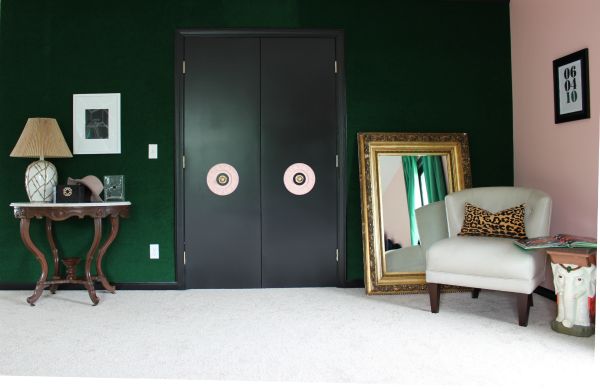 However, if you love your green carpet on the wall, go for it! You have to love your space and it has to reflect your own life, not mine. Hey, in my uninformed youth, I put really 70’stastic contact paper ( think chrome, yellow, orange, and brown arches) on, wait for it, unprimed drywall. Yeah. So you’re already ahead of my game at that age! Love your life, girl, and live it! Now I definitely don’t think I could embrace those shaggy carpet walls of the 70’s, Debra! hahaha!!! 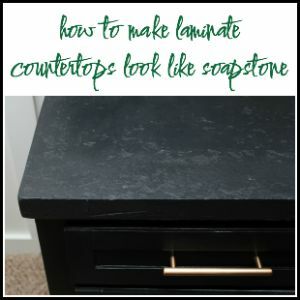 so glad I found this and it’s fabulous but also I was looking for the blog about the soapstone and couldn’t think wehre I saw it so double bonus for me. I love your design ideas and yes I love that green wall too. Wow! 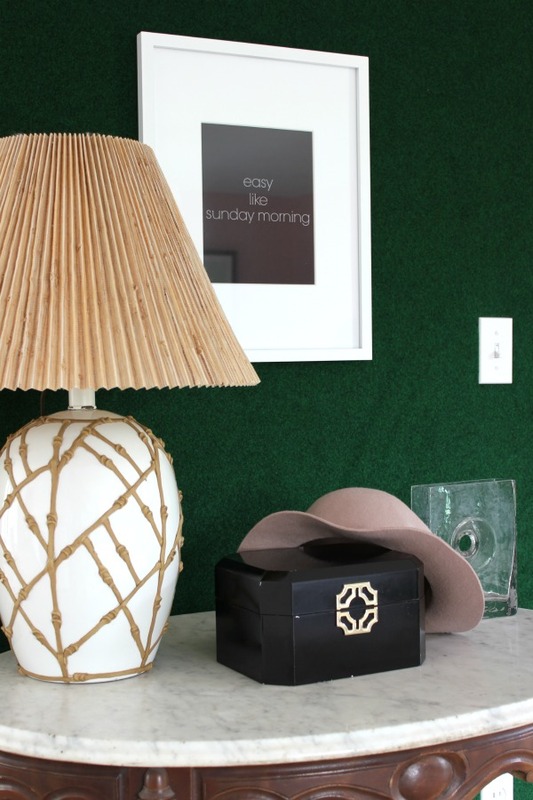 Wow, works great in your bedroom and is a really perfect shade of green for your decor. NEVER would have thought of doing this – your creativity is inspiring. I love your carpet wall, and the shade of green is just beautiful. I love the way you step out of the box, you own that box. Well done Jenna.